Awhile ago my friend and I went out for dinner and drooled over a particular menu item, baked brie with fresh fruit for dipping. Well since I have oral allergy syndrome and am allergic to most fresh fruit, we skipped it, but I vowed to make us baked brie another day. Lo and behold, as I searched around I found that many people actually bake brie in pie crust! 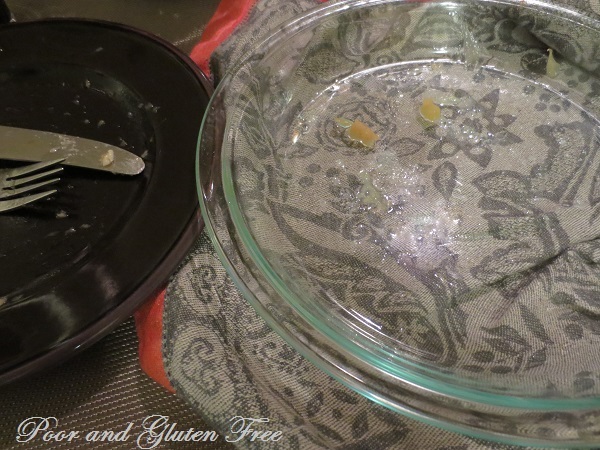 I'm a fan of edible bowls and such (less dishes, yay!) so we went ahead and made it with GF pie dough and an apple-pear compote (I can have cooked fruit, just not fresh) and grapes for dipping. The result? 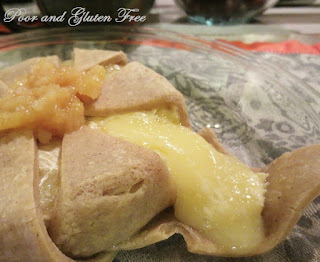 We ate the whole gorgeous, decadent, rich, gooey, flaky round of brie for dinner, using slices of pie dough to scoop it up! Naturally I don't recommend eating the entire thing between two people for dinner, but oh man was it amazing. It'll probably take weeks to work off that pound of cheese that is currently settling around my hips, but hey, you only live once, right and how often does one really get brie baked in pie dough?? This is really, really easy to make. 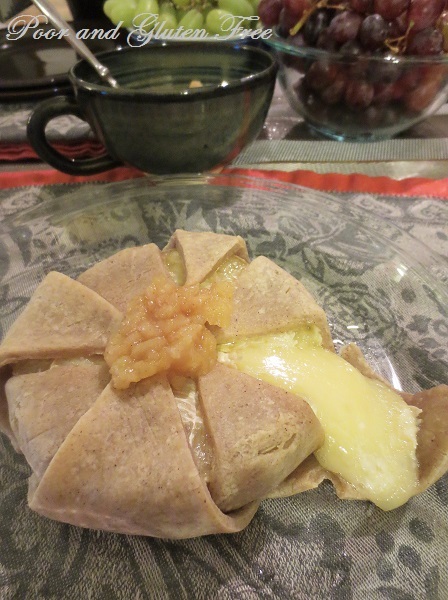 * If you decide to make the compote (recipe below), make it first as this is the most time consuming aspect and you'll want it ready when your brie is finished baking. 1. Cut the tough, white part off the top brie, leaving the sides and bottom. 2. After chilling the gluten free pie dough (it takes all of 10 minutes to make, then chill 30 min), roll it out. Next, using the brie round as a guide, cut out a circle a few inches bigger than the brie round. Then cut the circle into 8 pie-shaped triangle slices (I estimated, but wanted the slices to be long enough to wrap up and around the brie). I also cut out a small circle to center underneath the round. 3. Arrange the slices of dough around the smaller dough circle like a star, with the edges of the triangles slightly overlapping with the circle. Press the edges gently to seal them together. 4. Place the round over the dough circle, and wrap the slices up and over it. If the slices overlap a little at the tips this is good. Press the tips together to secure the cheese inside. 5. Gently move to the dough wrapped round to a greased pie plate. Bake in 350F oven about 15 minutes, until the dough is firm yet springy to the touch (it won't really brown, unless you brush it with egg white. I didn't bother to, but you might like it for presentation's sake). 6. Serve with fruit compote and fruit for dipping. * If you have leftover pie dough (I did): you could freeze it for later and make a couple of these mini apple pies with the leftover dough and compote, or these miniature chocolate pudding pies. 1. In a medium sized pot, heat oil over medium heat and fry ginger 1 minute. Add apple, pear and juice. 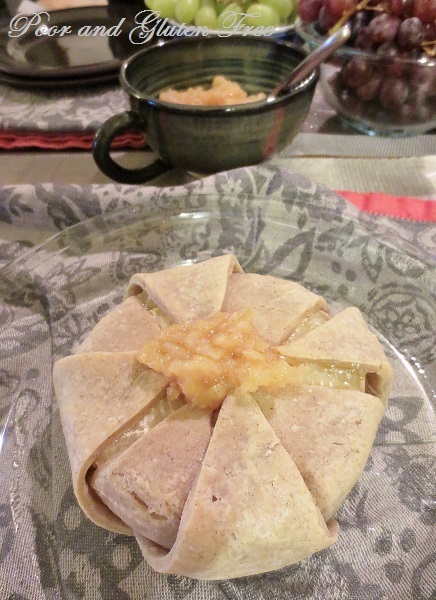 Cook approximately 20-25 minutes, until much of the liquid has evaporated and the pear and apple are soft and puffy. If desired, mash with a potato masher or spoon to thicken the sauce. Remove from heat and serve hot or chilled. *Alternatively, I noticed that some people arrange fruit slices, compote or chutney on top of the brie round before they wrap it in dough. This could be good, too. I just wanted the option of having a bite without the fruit! What's your favorite dinner party indulgence? Oh my, that looks amazing! I wish I had the ingredients on hand to make this right now! This sounds amazing. :) I love the "you only live once." Will have to make this soon! Oh. My . Gosh. I have brie and pie crust at home now! Yippie! I love baked brie and I only have one recipe. Pinning this... Thanks for sharing it with us on foodie friday. That looks so good. It really makes me miss dairy. 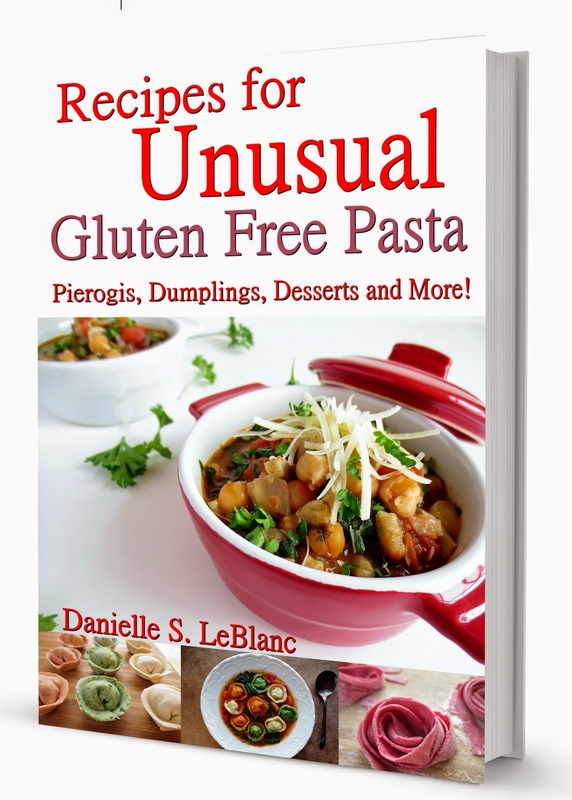 Thanks for sharing at Gluten-Free Wednesdays!